A couple of weeks ago I shared a sneak peak of this subway art dresser as part of a Silhouette Giveaway and Project. The dresser is part of my second oldest son’s room redo after his older brother (who used to share this room) moved into his own room which I share here: Boys Room Makeover. For a Lowes challenge, recently we were challenged to use Pantone’s Color of the Year in a project. Now I have spent the last year and a half transitioning green out of my home décor. My house was full of green and now it is not. 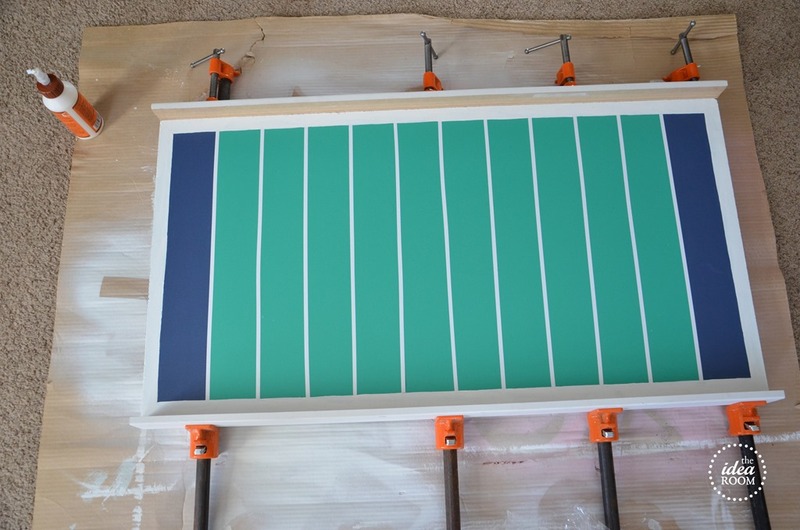 So this was particularly challenging for me simply because I had no where to use it in my home, and I am not a fan of making something that I was not going to really use. So I racked my brain about something that I could feel authentic about for my home’s style right now. 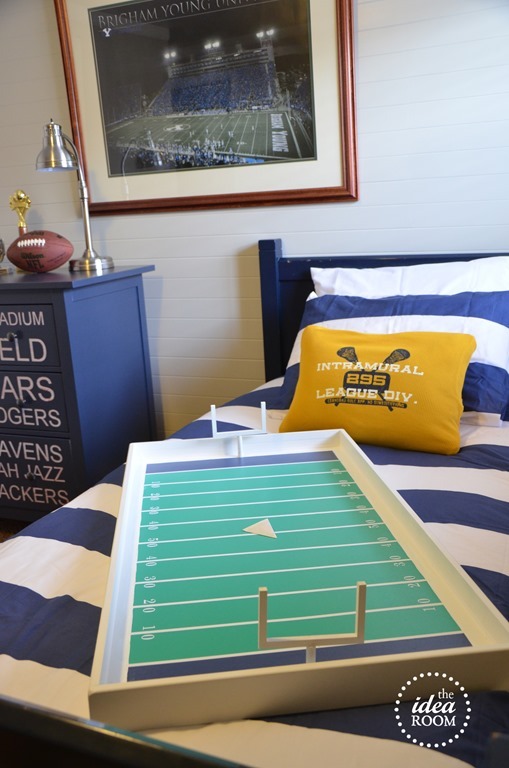 I was right in the middle of working on my son’s room, who LOVES sports, especially Football, Lacrosse and Baseball and he wanted a sports themed room. This kid loves to play the paper football game. You know the one where you make a triangle football out of a piece of folded paper and then shoot it through your opponents fingers that are shaped like a field goal? 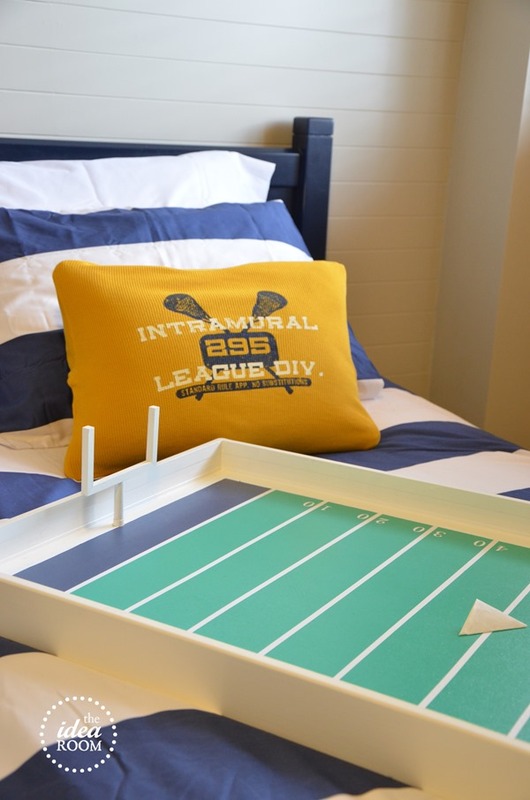 So I decided to make him a football field to play it on and to also double as room decoration. Here is how I made it. 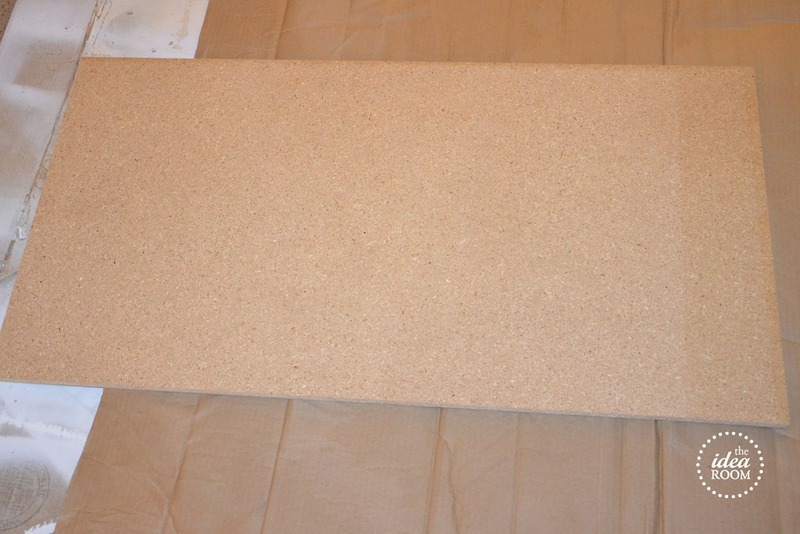 I took a piece of plywood and cut it down to measure 38 inches x 20 inches. My husband is such a perfectionist and insisted that this small field be the exact proportions of a standard football field. He played football in college and also is a huge fan of the sport, so I had to let him get his way on it, but let him do all the math to figure it out. I will just tell you the measurements so you can copy them if you want. 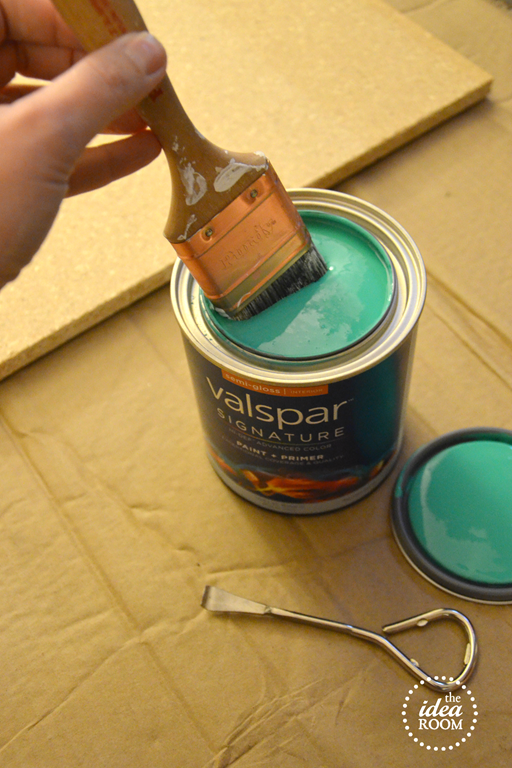 Then I painted it with Valspar Signature paint with Pantone’s Color of the Year: Emerald Green. It took two coats. 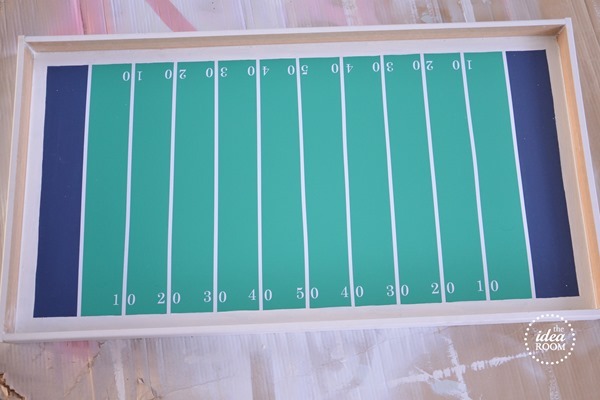 After the paint had dried I used a ruler to mark out the yard lines and goal lines on the field. 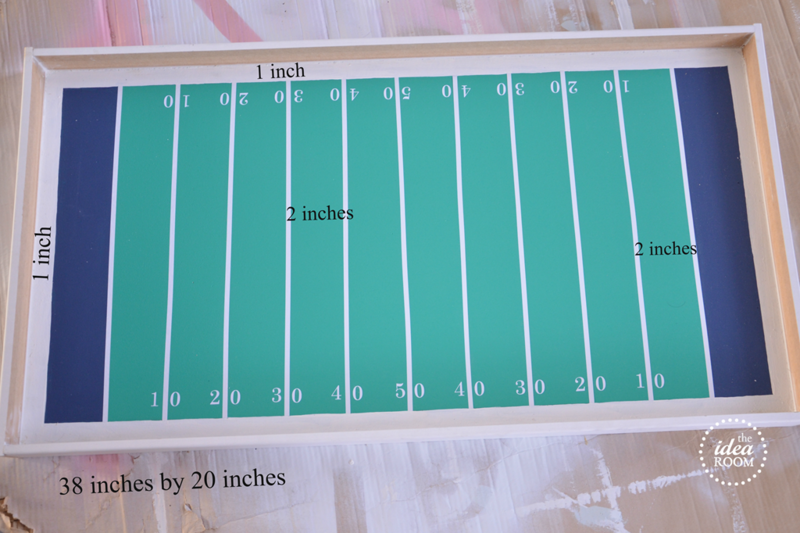 Then took my silhouette and cut out the yardage lines and numbers and laid them every 2 inches apart. I painted the end zones blue. Then painted a varnish over the entire field to protect the vinyl and to keep it from peeling off. I added some side pieces to make it into a box and simply used some flat door moldings that I had painted white. We cut two side pieces on the length 38 and the end pieces 20 and the extra width of the wood to make them match up. We glued them in place and held them together with clamps to dry. 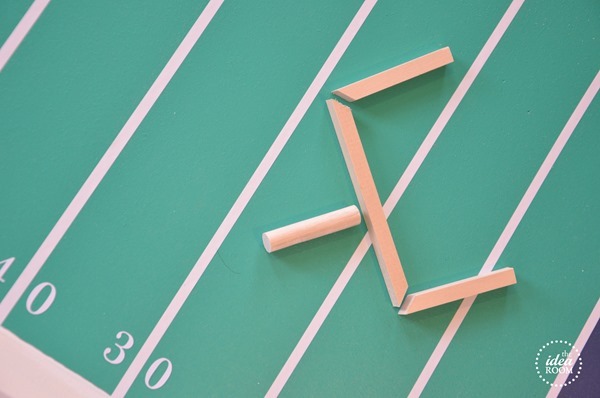 The field goals we made out of cutting a small wooden dowel for the base and then a square wooden dowel. We glued them together with wood glue and then drilled hole in the end zone for them to sit in. You can glue them in place or just make it so they can be removed if needed. We opted for the latter since my son likes to use this for his little football and soccer guys to play on as well. He puts a little soccer net on the field sometimes. Now this sits in his room as décor when he is not using it. I am pretty happy with how it turned out…especially because he actually uses it. That is always a bonus. 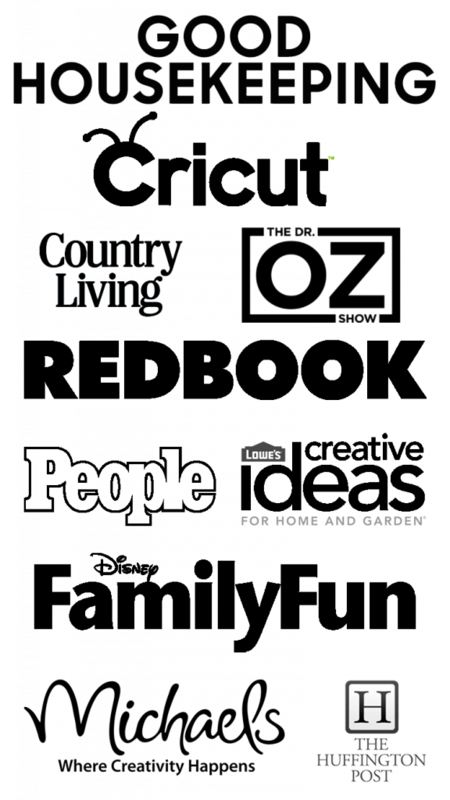 Looking for more creative ideas for your home? 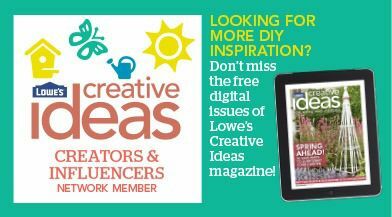 Sign up for Lowe’s Creative Ideas Magazine. 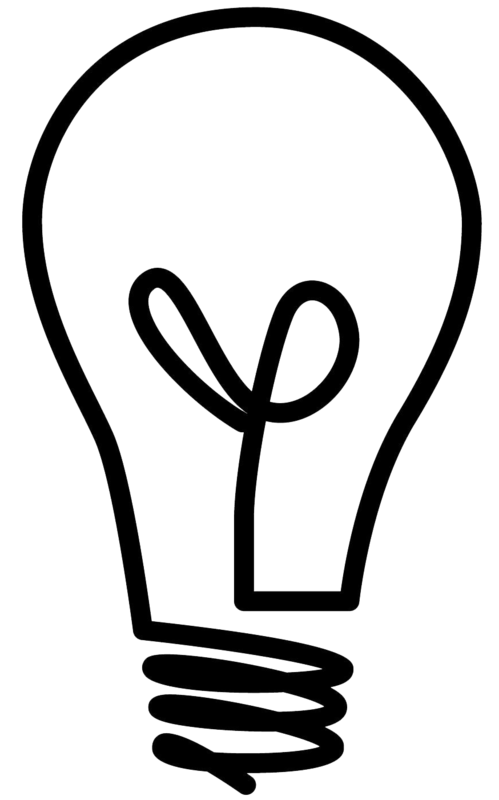 It actually has a lot of really great and creative ideas that you can and would want to do. 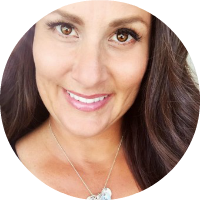 Go ahead and check it out! 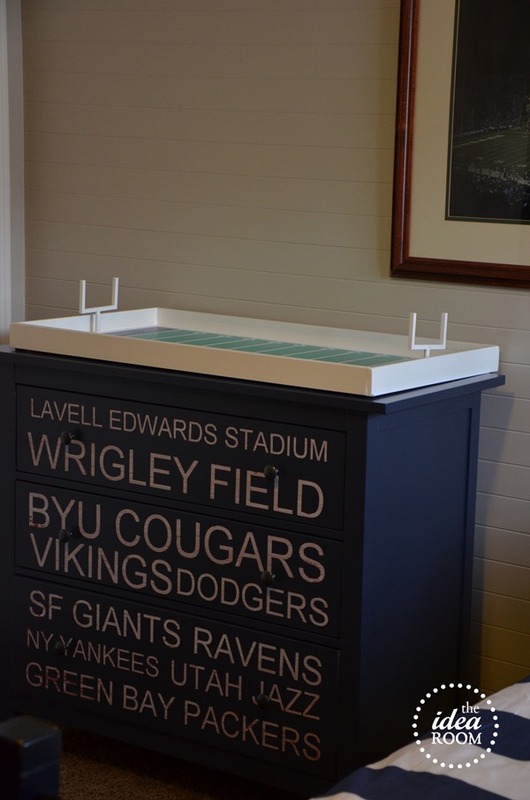 Ny Devin would love this… I am pinning! Great addition to his room and a super creative use of the green paint! Everything turned out great! What a great way to use the green paint! I love that color. LOVE that color. i need to figure out what piece to paint with it! Very creative idea with that football game! Did you make that dresser as well? 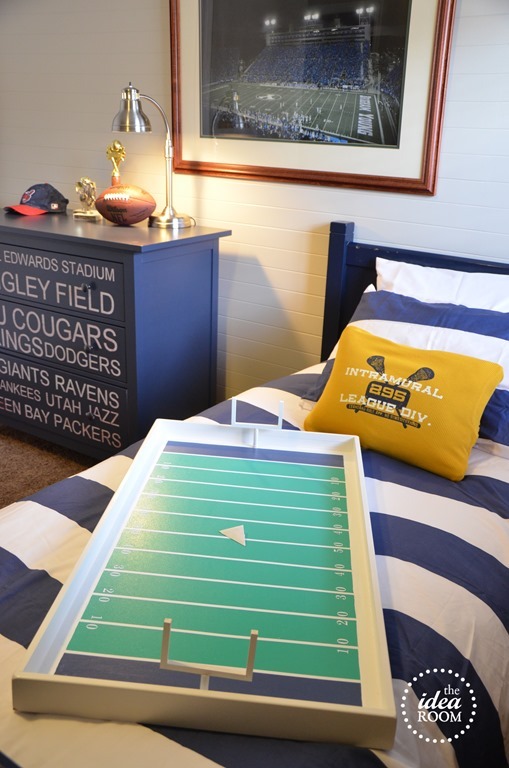 My husband and I just decided to redo our son’s room in a Michigan Wolverines football theme and so far have gotten him a huge phat head of the Michigan ‘M’ and some college bedding with the Michigan logo on it, but I think a dresser like that would totally complete the room. I did make the dresser! And you know what? Your comment made me realize that I never did post the tutorial for how I made it LOL! So…I guess I need to be sharing that tutorial here soon. I just basically used my vinyl machine and cut out the team names and then painted over it and peeled off the vinyl. Your room sounds fun! I am sure your son will love it!